The United States Coast Guard hangar at the Los Angeles Airport (LAX) was worn and aging. Facility maintenance employees were looking for a long-term solution that would provide cost savings, Title-24 approval, energy efficiency and they wanted to avoid a costly and timely roof replacement. 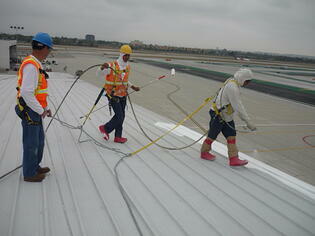 The 39,300 square foot hangar had several challenges that needed to be met. 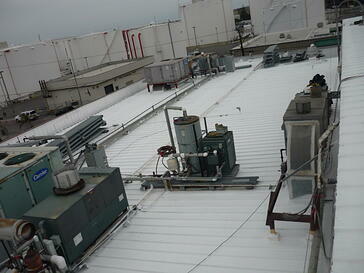 There were metal panels that required repair and maintenance. There were sections where rust needed to be removed, replaced and re-coated with a rust-inhibitive acrylic primer – RustShield A120. This ensured proper preparation of the rusted surfaces in order to provide excellent resistance and protection against flash rusting and corrosion. The hangar also required a durable coating that could withstand updraft from helicopter rotor blades during take off and landing. National Coatings provided the US Coast Guard with the AcryShield® Roof Management (ARM) System along with the replacement and re-coating (RustShield A120) of heavily rusted sections. The metal roof coatings used in the ARM System provided additional protection to the metal roof from the harsh conditions of jet fuel and salt water in the air from the nearby ocean. The white reflective topcoat was Title-24 compliant and provided the US Coast Guard with a cooler temperature inside the large metal hangar. The AcryShield metal roof coatings are able to to reflect a majority of the heat away from the structure, prohibiting the building from absorbing much of the sun’s heat, resulting in a cooler environment inside the building. The US Coast Guard was pleased with their decision to use metal roof coatings to restore their hangar opposed to a full roof replacement which would have been much more costly and time intensive. The AcryShield Roof Management System allowed the US Coast Guard to maintain their existing roof, eliminating any tear-off costs and loss of time due to tear-off procedures. This metal roof coatings system provided a sustainable and renewable solution allowing the US Coast Guard to extend their roof service life and lower roof maintenance costs indefinitely. 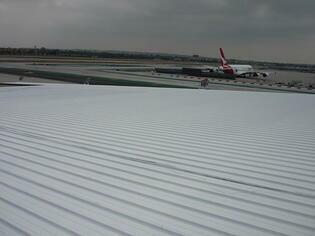 For more information on metal roof coatings or systems, download our FREE METAL COATING GUIDE!